Advice From a Master Electrician-Don’t Do It Yourself! Do you know what the latest building codes are for your home? 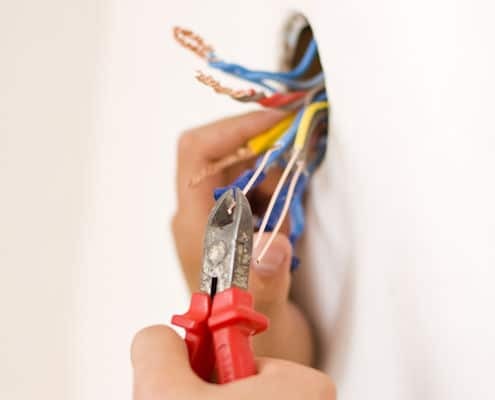 Have you trained extensively in how to properly install wiring and lighting in a new home? If you say no to any of these things, then I want you to say these words out loud, ” Don’t do it yourself “, or more appropriately, ” I should NOT be doing this“. Would you like a little advice from a Master Electrician here in the Vero Beach Area? If you have a project involving electricity, other than plugging something in, don’t do it yourself. Please. Every week, sometimes every day, we get calls from people saying, I tried to install this myself but it’s not working. Now, we want to share a little secret with you. Not working isn’t the worst problem to have when you have been playing with electricity. The worse problem is overloading your system and causing a fire. So please, there are things you can do yourself, like painting or tile work. But there is almost never a good time for a person with little to no knowledge to tackle electrical work. Its just not worth the risk, or the amount we are probably going to have to charge you to fix what you have already done. Should you attempt an electrical repair and it seems to work just fine, understand that Cliff has trained for years to become a Master Electrician. Beyond that, he also keeps up with changes in the building code which are in place to keep you and your home safe. If you do an addition or a repair and it looks like it works, but it’s not properly installed, that will lead to issues down the road. In the event that you put your home on the market, a property inspector may notice that something you have done is not up to code. While it may be an easy fix, that buyer could very well back out of the deal because they are now unsure of what else you have done to the home that’s not right. We want to wish you a safe and happy holiday season. And remember, don’t do it yourself when it comes to electricity. https://www.verobeachelectrical.com/wp-content/uploads/2017/08/install.jpg 400 495 Kelley McCabe https://www.verobeachelectrical.com/wp-content/uploads/2018/05/VeroBeachElecLogo.png Kelley McCabe2018-12-06 10:12:552018-11-28 17:25:06Advice From a Master Electrician-Don't Do It Yourself!